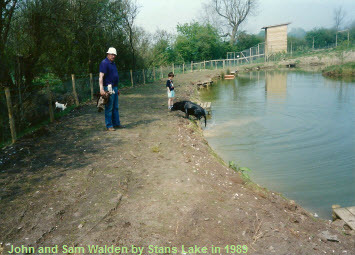 In early 1983, it was accidentally discovered that some of the land which is now Blackland Lakes Campsite was very wet. A trial excavation was carried out and immediately clean, drinkable, spring water poured in to the resulting hole. Digging, with an old fashioned drag line machine, continued for the rest of 1983 and the three lakes were constructed. It was established that the Spring Water had originations dating back some 2 million years to the Ice Age. The site is close to the Marlborough Downs and when the ice melted it brought chalk with it, the extremity of which is where our Lakes are today. As we dug formations of chalky rock were found (which was quite a problem!). This had leaf fossils which hadn't seen the light of day since prior to the Ice Age. The rock which was exposed is called "Tufa". The remaining 12 acres of land were subsequently drained and as they are also level, they are just right for camping. A wide variety of native coarse fish were introduced which have thrived over the years. Improvements have been made to the two main Fishing Lakes, including widening and increasing the depth. 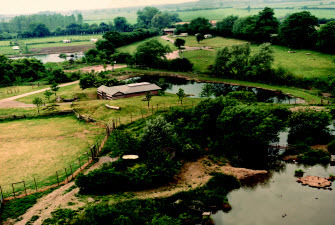 The third Lake is a nature reserve which is the home to a variety of ducks and geese. Kingfishers are residents as well as many other birds including Woodpeckers, Herons and Owls. Bats can be seen at dusk. In recent years we have received two nature conservation awards, one from the Wiltshire Trust for Nature, the CLA Conservation West Award and the other quite prestigious Professor David Bellamy Silver award for Nature Conservation. It was established as a Campsite in 1984 and the first amenity log cabin building was constructed. A second amenity building and Reception/Shop were added in 1989. The site is unique and special in many ways and has matured to become a most attractive, friendly and welcoming environment.